Being a South Indian food lover I always look for the places where I can get authentic south India food. Many of us think that South Indian food is all about only Idli, Dosa and Sambhar but believe me South Indian food is much more than this. Delicious seafood, fluffy appams with stew, chemmeen theeyal (prawn curry), uppittu (upma), spicy pork curries, Chepalapulusu (fish curry), egg pulusu (egg curry) and lots more are authentic south India recipes must to try. All South Indian recipes have a perfect balance of ingredients, taste and cooking techniques. Every region has its own specialty and use of ingredients and cooking techniques. South India has 5 states and 2 union territories from rocky plateau to river valleys every part has its own unique flavour. Kerala, Tamil Nadu, Karnataka, Telangana and Andhra Pradesh as well as the union territories of Andaman and Nicobar, Lakshadweep and Pondicherry have their own languages, culture and many different cuisines. Kerala is known as the land of spices- cinnamon, cardamom, cumin, nutmeg, chilli, mustard and curry leaves all comes from the Kerala. South Indian cuisine is like an exhibition of regional food cultures full of variety and delicious recipes. There are many south Indian food restaurants all over India serving authentic south India recipes here we are with some of the best south Indian restaurant in Delhi to get traditional South Indian food. 1. 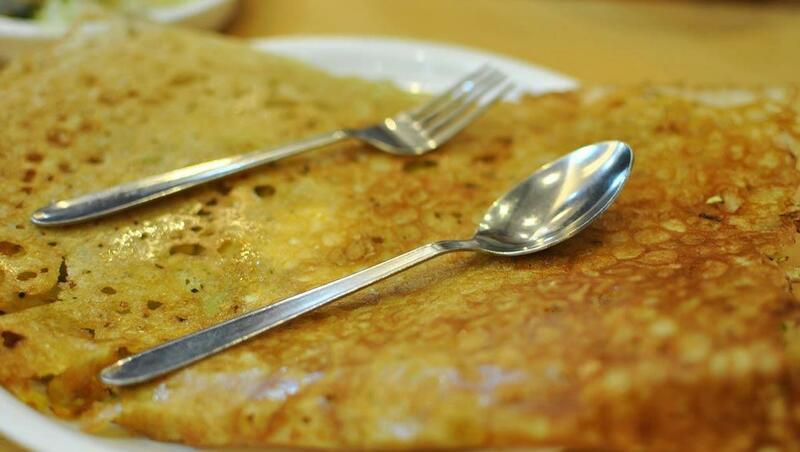 Saravana Bhavan, Connaught Place- It is one of the most visited restaurants for authentic south Indian food in Delhi. I usually visit Saravana Bhavan to have my favourite south Indian delicacies like Appam with coconut milk and side dish, Curd Rice, Parotta, Upma with delicious chutneys and pickles. Saravana Bhavan serves authentic cuisine of Tamil Nadu that taste will remain on your taste buds for long. Do not forget to buy sweets and savouries munchies like cashew nut pakoda, Murukku, Mysore Pak and lots more snack items from restaurant sale counter at very affordable price. Some other delicious South Indian recipes served at Saravana Bhavan are Idiyappam with coconut milk or side dish, large varieties of dosa, delicious rice preparations, real fruit milkshakes and mouth-watering sweets all are on the menu of Saravana Bhavan. There are 3 Saravana Bhavan Outlets in Delhi at Janpath, Connaught circus and Select City walk Mall Saket. It is for vegetarians only, serve Jain food also (without onion garlic). Average cost for 2 having food at Saravana Bhavan would cost approx. Rs 600. 2. Karnataka Food Center (KFC), RK Puram- It is a pocket friendly South Indian food joint popular for its delicious Kannada cuisine. It is quite popular among the students of South Campus and locals to have delicious south Indian food without having a big hole in your pockets. 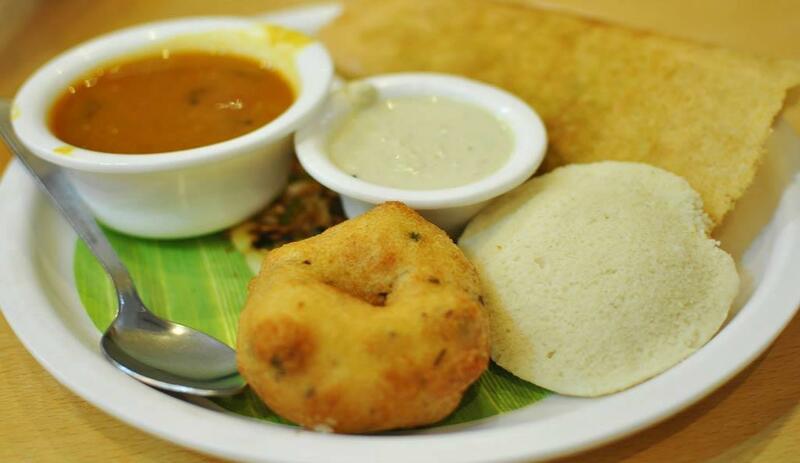 Number of delicious Dosa and Uthappam with piping hot sambar and coconut chutney are must to try. They also have their weekly special – a new dish on every day. It is usually a busy place so one has to wait for 20-30 minutes before getting seats. Average cost for 2 having food at Karnataka Food Center (KFC) would cost approx. Rs 400. 3. Dakshin, Saket- Located inside the Sheraton New Delhi Hotel it is one of the best restaurant for having delicious South Indian food. Enjoy the seafood specialties from the Moplah community in Kerala or have the traditional vegetarian recipes of the house of Iyers and much more, Dakshin has all what you want. Dakshin offers tempting South Indian dishes from Andhra Pradesh, Tamilnadu, Karnataka and Kerala. Gongura Mamsam from Andhra Pradesh, Meen Moilee from Kerala, Chicken Chettinad, Masa Stew and lots more delicious recipes are served at Dakshin, Saket. Each item on the menu is cooked in its own distinct spices and style. Many of dishes are served here with rice and some others come with Appams or idiappams. Restaurant has Iyer's Trolley named after Chef Paramasivam Iyer serves small adais, banana flavoured dosais and delicious kuzhi paniyaram. They also have full bar facility available. This restaurant is on little higher end average cost for 2 having food at Dakshin, Saket would cost approx. Rs 3000. 4. Mahabelly, Saket- It not only serves great food but the ambience of the restaurant will make your meal quite an experience. It's a great choice for South Indian food and they offer many options to choose from. They also have a full bar facility so apart from having an authentic Kerala food, you can also sip on some of the finest alcohol from their Mala-bar. Kootu curry, Mini vada with chutney, kappa (a traditional Tapioca dish) will set your expectations high. They also serve fresh seafood which is really a delicacy in the heart of city. Average cost for 2 having food at Mahabelly, Saket would cost approx. Rs 1500. 5. Naivedyam, Hauz Khas Village- It is the one stop destination for having most authentic South Indian food. Naivedyam means the food offered to god before eating it and the food here justify its name completely. Paneer Rava masala dosa, malabar Paratha with kurma, Fried idlis and lots more to offer, every single recipe is must to try. They also serve Naivedyam thali a great way to enjoy many delicacies in single plate. Some of my favourite South Indian recipes at Naivedyam are Appam Kurma, Thengai rice, Mysore pak, Holige with ghee and payasam. Average cost for 2 having food at Naivedyam, Hauz Khas Village would cost approx. Rs 500. 6. The Toddy Shop, Hauz Khas Village- It serves traditional south Indian food that one can find in local toddy shops or kallu shops of Kerala. They serve both traditional vegetarian and non-vegetarian food along with full bar facility. Thair Sadam (Yogurt and rice tempered with mustard seeds), Pothu Erachi Varattiyathu, Semiya Payasam, Neychoru (Traditional ghee rice) are must to try. Do not forget to have Kaapi (Kerala filter coffee) as it taste great and help you to get digest all you eat. Some of my favourite South Indian recipes at The Toddy Shop are Chemeen Moilee with Appam, Cheratta Puttu, Kadala Curry, Avial, Kesari Halwa. Average cost for 2 having food at The Toddy Shop, Hauz Khas Village would cost approx. Rs 1500. 7. Sagar Ratna, Ashok Vihar- It is also on the list to provide best south Indian food in Delhi though they also start serving north Indian and Chinese cuisine too but South Indian food is their prime focus always. You can enjoy authentic South Indian delicacies here. Hot garlic dosa, Onion Uttapam Podi, Payasam, Madras Idli Fries, mouth-watering desserts and lots more there for everyone. There are many branches of Sagar Ratna in Delhi so one has lots of outlet to enjoy delicious south Indian food. Average cost for 2 having food at Sagar Ratna, Ashok Vihar would cost approx. Rs 600. 8. Andhra Pradesh Bhavan Canteen, Feroze Shah Road- It is a property of Government of Andhra Pradesh in New Delhi serving delicious Andhra food at very affordable prices. They serve both vegetarian and non-vegetarian Andhra delicacies. Though the ambience of the canteen is very simple but the food compensate all. As it is government canteen so has fixed timing for breakfast (7:30 am to 10 am), lunch (12.00 noon to 2:45 pm) and dinner (7:30 pm to 10 pm) so be on time to enjoy delicious food. Mutton Fry, Fish Curry, Spiced Rice, Hyderabadi Chicken Biryani and lots more other delicious Andhra dishes are on menu. Average cost for 2 having food at Andhra Pradesh Bhavan Canteen would cost approx. Rs 600. As I am a big lover of South Indian food so whenever I come to know about any south Indian food outlet and chain I cannot stop myself to visit there and enjoy the food. Each one of these is my personal favourite. I know there are much more just in case you have some more suggestions and your personal favourite that you think should've been featured on the list, please share it with us in the comment box below.